In April, World Autism Month, the LIFT 4 Autism team set out to raise $25,000 for Kulture City, our national charitable partner, supporting their efforts on behalf of ASD families. The romance reading community came together, donated, bid, bought gear and spread the word. We are thrilled to report that YOU DID IT! 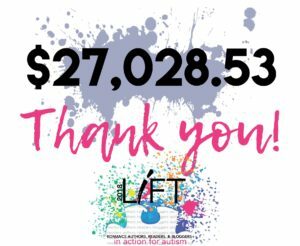 That is your LIFT 2018 TOTAL!!! Thank you to all who were involved! Your generosity will offer direct assistance to ASD families who need it. 1. DONORS: We emailed notifications of your winning bidders last week. It may have gone to spam. Search your email for noreply@auctria.com. If you don’t see it, email us at liftauction@gmail.com, and we’ll pull the information manually. so you can contact your winners immediately. 2. WINNING BIDDERS: You should have heard from your donors by now. As mentioned, some notifications have gone to spam, so they may not have seen them and it is not a reflection of neglect on their part. 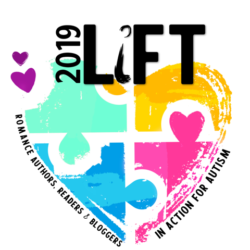 Please email us at liftauction@gmail.com so we can connect you with your donor and expedite shipment of the items you won. *Please use the LIFT email and do not PM individual team members. Thank you for all your help in exceeding our expectations AGAIN!